Is there are a Social Profimatic Scam going on? Day after day there are different trends on the internet and the different social media platforms, whether it is a business, viral video, funny moments, products selling, and even online jobs and opportunities. Social media is the best place to earn or find part-time jobs that you don’t need to go in a workplace rather your home will be your workplace. Finding an online job is very easy because every day there are different opportunities and hiring or some you don’t really need to hire just sign up and you can start earning. One of the most famous online jobs is the Social Profimatic. Social Profimatic receives different reactions from the networking circle because it is very easy to do and very convenient to earn. I’m very sure that you are one of that individual who sees Social Profimatic being shared on the social media. 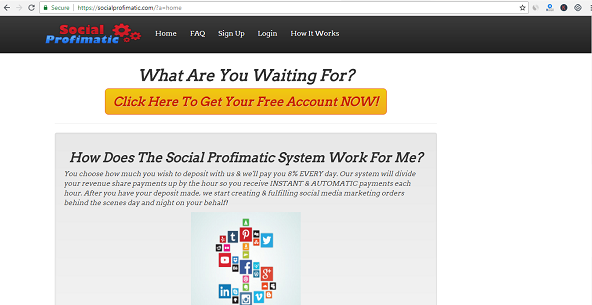 First of all, Social Profimatic gives anyone an opportunity to earn easily. We will be discussing to you the basic points and terms you need to know about the Social Profimatic. Like is it legit or a scam? Or will it deliver the benefits and rewards it promises to you? 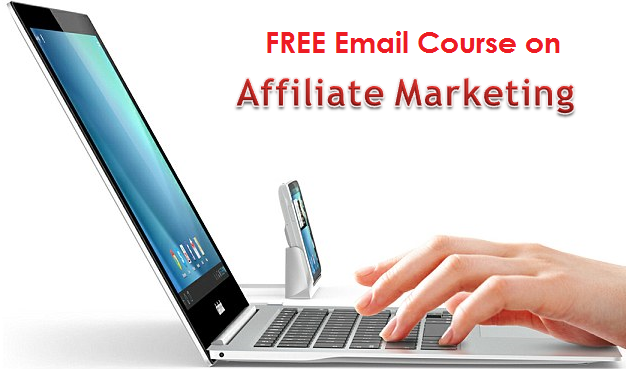 Basically, Social Profimatic is the biggest MLM opportunities available in the marketing industry. Social Profimatic doesn’t show any information who owns the company, where and when it is published. There are some websites saying that these company started in February 2018, unfortunately, it isn’t true because even the earlier years Social Profimatics are being posted on the different social media platforms. Social Profimatics is simply an opportunity provided to its user through registering on their sites. You don’t need to sell products or to do any task. Simply they give opportunities. Unfortunately what other critics saying about Social Profimatic is true. For example, an MLM company or sites have their own brand lines or product lines. Unfortunately, Social Profimatic has no any product line which is very suspicious. Meaning to say you are simply being bait by these companies or you are being a scam, but they provide bundled opportunities for the members but with no exact plans or ways. In order for you to start your Social Profimatic account, you need to invest a $10 bitcoin/litecoin in order for you to receive an 8% return of investment. Unfortunately, this form of business will not appropriate for those who don’t want to spend money or don’t have any capital. Also, it is another sign that you are entering scheme or scam. 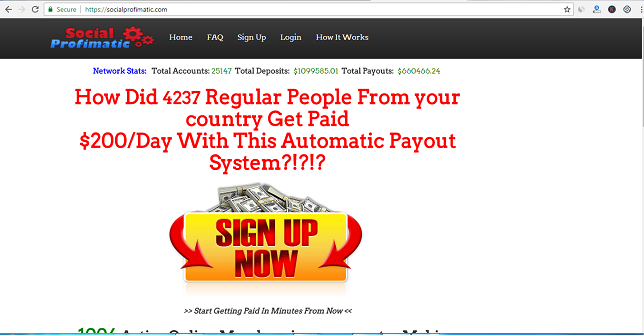 An online business or job opportunity will not require any capital. One of the ways for you to earn in this Social Profimatic is through referral commission system. If you were able to refer different individuals to join and be part of it you can earn extra money. There are two ways you will be paid by referral commission. First is 10% commission for level 1 and 3% commission for level 2. In order for you to be part of it is to have a 410 worth of bitcoin or litecoin. So if you are thinking to join this better to think twice. There is still no any evidence or proof that there is a Social Profimatic Scam going on. After you finish reading this article you will surely still ask yourself whether Social Profimatic is a Scam. What you need to do is to be more careful. Social Profimatic is not advisable for those who want to earn but don’t want to invest any amount of capital. But for those who want to earn and have a greater opportunity to double their money, then you should start now. As I’ve said no form or MLM company that doesn’t have any product line, better think twice if you will enter this group because these requirements show that they pass one of those red flags of scammers. 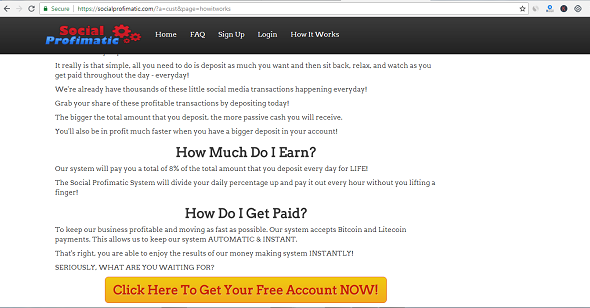 If you were going to ask me if the Social Profimatic is a scam, I would say yes, entirely it is a scam. Fortunately, there are a lot of ways in order for you not to be a victim of this scam, you should know basic precautions. According to the Social Profimatic and I quote that for the last 8 years they developed a massive inventory of Social Media assets, profiles and other social media inventory. 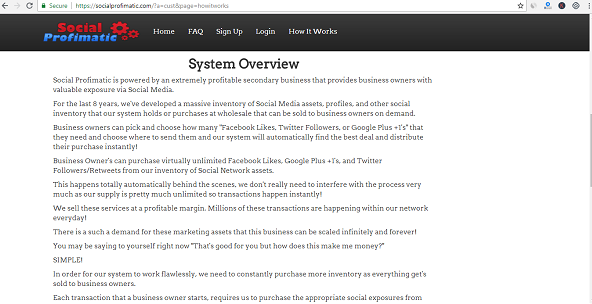 That the system of Social Profimatic purchases at wholesale and it can be sold to different business owners. This statement doesn’t make any sense about the return on investment. 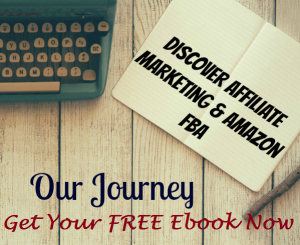 What is true is that the Social Profimatic return on investment is more 300% yearly. Based on the data and information that we gather Social Profimatic doesn’t pass any requirement to be considered as a legit form of MLM. Social Profimatic is basically a scheme based on the data and information I gathered because of two main reasons. First reason, is the Social Profimatic doesn’t have any product or service line which is very suspicious because how you will earn if you are not selling anything or you are not promoting any form of products or services. Also one of the main faces of MLM is that they do have their own product line and Social Profimatic doesn’t have any product and service line. 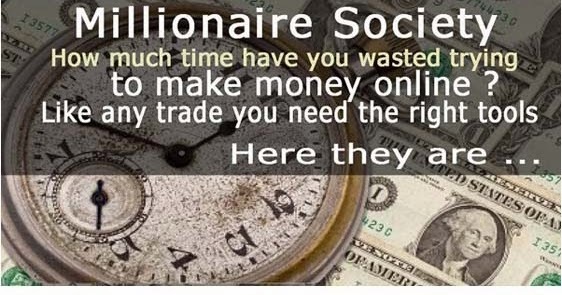 Second, Social Profimatic as an initial investment for you to earn, the reason why people look for a convenient job online is they don’t want to expose any form of investment rather their time and effort. Social Profimatic asks for an initial investment in order to be part of it. How possible that you will gain your return on investment if you are not selling anything. These two basic reasons are a very big impact for you to think twice about whether you will be joining the team or not. Proper knowledge and understanding of what a real MLM is, will save you from being a victim of this scam. Make sure that if you want to earn and you want a convenient way to earn you consider every single factor. Don’t be attracted to their form and their picture rather make a research and understand the company properly.